Clear-Com®, a global leader in professional voice communications systems, has announced that Ferrari World Abu Dhabi, the first Ferrari branded theme park, has installed FreeSpeak II digital wireless intercom system for ride operation coordination, communication and safety. Clear-Com Distributor NMK Electronics Enterprises assisted in the system design. Known as the world’s largest in-door theme park, Ferrari World spans 86,000sqm and boasts a wide range of rides and attractions. FreeSpeak II will be used by the staff operating two rides: Karting Academy is inspired by the iconic Yas Marina Circuit, and features the first electric powered go-karts in the region racing around a 290m track, with speeds of up to 50mph; while the Scuderia Challenge is an interactive motion simulator, allowing challengers to sit behind the wheel and take on the virtual Yas Marina Circuit in a full body immersion racing experience. Due to the noise levels and speeds associated with the rides, the operators required a clear, effective and reliable communication system. FreeSpeak II allows large numbers of wireless beltpack users to simultaneously roam across an expansive operation and stay connected without compromising on performance. 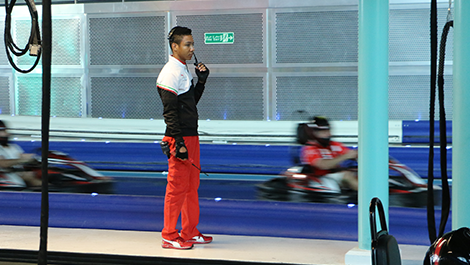 This was particularly important due to the safety measures adopted in rides such as Karting Academy and Scuderia Challenge, with operators situated far from one another during operation, making seamless connectivity a necessity at all times. As well as the ability to communicate across vast expanses of space, the sound needed to be clear so that if an emergency did arise operators could communicate and understand one another and react immediately. FreeSpeak II enables beltpack users to continue enjoying the highly intelligible and digitally clear ‘Clear-Com Sound’ at 7kHz ‘commentator’ audio bandwidth. This level of sound quality offers an excellent audio experience and reduces the strain on the user’s ears after extended usage.